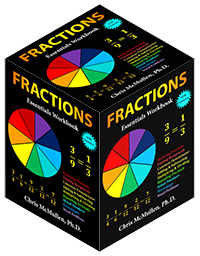 ← Is a Book Worth More than a Greeting Card? Don’t use the tab key for anything. Don’t use two or more consecutive spaces (not even after a period). Don’t press the Enter key three or more times in a row. Use Word’s styles for any and all formatting that can be done through the styles (including indents—yes, it is possible). Avoid special characters and formatting that may not be supported on all devices. 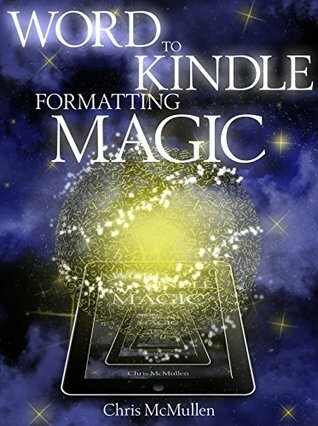 Rule 4 is critical toward achieving consistent Kindle formatting from Word. How to do this is the focus of this article. The last rule just requires a little research. Beware that some fancy features, like dropcaps, are supported on many devices, but don’t format properly on all devices. When in doubt, simple works better. The secret to good Kindle formatting is to apply any and all formatting through Microsoft Word’s styles. Don’t apply formatting directly to highlighted text or paragraphs—not even for first line indents. Instead, set the formatting in a style and apply the style to the paragraphs (or text). Note: Some styles (e.g. Normal) apply to entire paragraphs, other styles (like Emphasis) apply to text, and yet others can apply to either. The distinction is important because if you highlight just some text and apply a paragraph style, it will modify the entire paragraph rather than just the selected text. You can tell what a style applies to by clicking the little arrow-like icon below where it says Change Styles. Then look next to the style name to see if it has a paragraph symbol, an ‘a,’ or both. Right-click a style on the Home ribbon in order to modify it. For Kindle e-book formatting, leave the color set to Automatic in the Normal style (because a customer might choose to read in night or sepia mode, for example). You needn’t set a font, as the customer will choose the font from his/her device, though if you do pick a font, using a very common font like Georgia is apt to work best (but, again, the customer gets to control the font from his/her device). 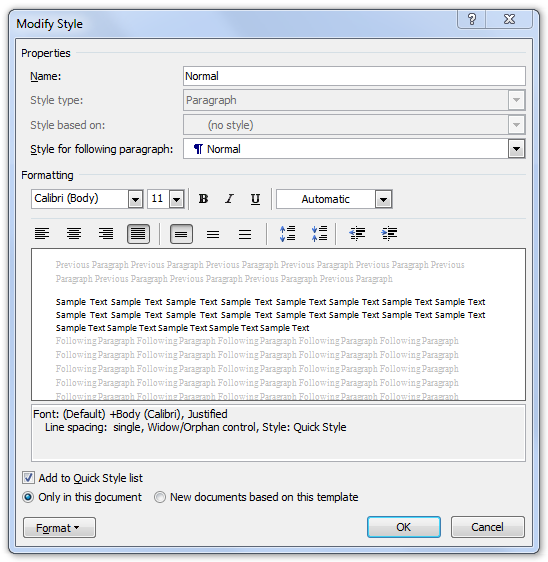 Apply the font style, font size, linespacing, indents, and all other formatting through Word’s styles. Don’t highlight text or paragraphs and apply formatting directly to the text. Instead, modify a style to suit your needs and apply that style to selected paragraphs (or, when applicable, highlighted text). All styles other than Normal allow you to check a box to Automatically Update after right-clicking and choosing Modify. This is convenient to apply changes to that style throughout your document. Not with the tab key! Not by going into the paragraph menu and using first line indent. Close, but no cigar! Choose Modify > Format > Paragraph. Change Special to First Line. Set the value to 0.2″ or so (definitely, not 0.5″ as that’s huge on a small screen). Apply the style to paragraphs you want formatted this way. Not indenting is even trickier. Kindle automatically indents non-indented paragraphs. So the trick is to copy the Normal style and give it a different name, like NoSpacing (don’t put a space in the name). This new style will be modified and used for non-indented paragraphs. To copy a style, click the little arrow-like icon below Change Styles at the right of the Home ribbon to pull up the styles menu. Find the three buttons at the bottom of this menu (this menu pops up at the right side of your screen). Click the left button (of these three buttons) to add a new style. Choose the style you want this based on (pick Normal). Name the style (e.g. NoSpacing). Modify the style as needed. Modify this new style as follows: Click Format > Paragraph, change Special to First Line and set the indent to 0.01″ (not smaller). Note: Setting this to zero will backfire! As always, modify the style and apply the style to the paragraphs. Don’t apply First Line Indent directly to paragraphs. The first paragraph of the chapter is typically not indented. This is typical of most traditionally published books. Stand-alone, non-centered lines like subheadings or lines from your table of contents also need to be non-indented. There are typically many such lines throughout the book. Remember, if they appear non-indented in Word, they’ll be automatically indented on Kindle. Unless you apply the NoSpacing style to those paragraphs. Indenting isn’t an issue with centered text, e.g. using styles like Heading 1 that center text. You can even use Word’s styles to create page breaks. You should be using Heading 1 to create your chapter headings. If you want each chapter to automatically start on a new page, and if you only apply Heading 1 where you want to begin a new page, you can remove all of your current page breaks and instead implement them through Word’s styles. Right-click on Heading 1 to modify it. Choose Format > Paragraph > Line and Page Breaks and check the box for Page Break Before. Why Do You Need to Use Styles? When you upload your file to KDP, it gets converted to a .mobi file. In this conversion, KDP reads your Word file as an HTML file (yes, even if you upload a Word document). The top of your Word’s HTML (even if you don’t upload an HTML file, this still applies to you) defines all of Word’s styles. If you highlight selected text or paragraphs and apply formatting directly to them, you introduce formatting contradictions: The styles say one thing, while the specific paragraphs or text says another. This confusion can lead to inconsistent formatting in the all-important Look Inside or on specific devices. If you only apply formatting through the styles, then you won’t have contradictions, which leads to more consistent formatting. So much info to retain! Ugh! I need this though. Hope to be using it again soon! Smashwords has a very thorough free style guide to formatting in Word for publishing ebooks through them. I used it for all 4 of my books and the resulting documents were also fine for uploading to KDP. Just go to Smashwords.com and look at the FAQs. That is a good guide. With that guide, too, it’s still important to make formatting changes through styles, rather than apply them directly to paragraphs, for optimal Kindle results. Should I convert them to HTML first? I don’t, but everything seems okay when I upload my files. Kindle hasn’t rejected them. Only if you have a good list of specific improvements worth making. Depending what you do after, it may not be necessary. So much to learn and know. I have a simple method. I do the Smashwords formatting first, and if you can follow all their rules to their satisfaction, then all you have to do is add page breaks to the same doc., create an HTML, and voila! Your Kindle will look fine! I’ve always used WORD to write with and learned as I went went getting ready to publish to an ebook. 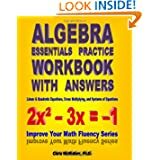 There was one one book I found that helped, but your post is great information and I thank you. 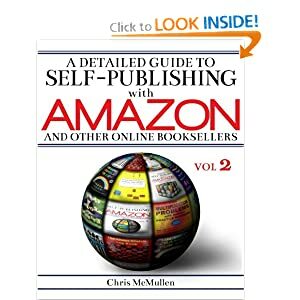 I thought this blog was so good I’ve put it on my Facebook and my publisher, who formats all of my books for me, left a comment about your article saying ‘Spot On.’ I have also reblogged it on my blog. How do I get the 0.2 indentation to work throughout the document? It seems like it works when I manually take out the tab indent, but that would be a lot of work to go paragraph by paragraph. Don’t use the tab key at all. 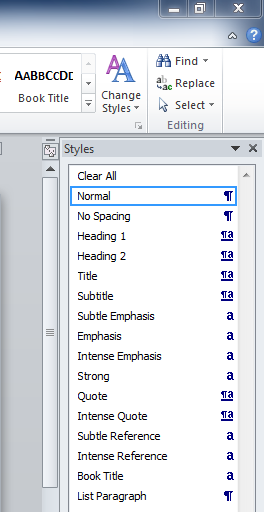 If you put the first line indent in the Normal style, then all paragraphs associated with the Normal style will automatically indent that amount (so all you have to do to indent the next paragraph is press Enter; the indent will occur automatically). If you’ve used the tab key, you want to remove all of those tabs. Hit the Replace button on the Home ribbon. Click the More button. Click Special and select Tab Character. Leave the Replace With field blank. Click Replace All. Each of your tabs should magically disappear. If you need to apply the Normal style to paragraphs (e.g. if you’ve updated the Normal style, but some of the Normal paragraphs haven’t updated), highlight several Normal paragraphs at once and click the Normal style to apply it to the selected paragraphs. (Styles other than Normal update automatically.) You can apply it to many paragraphs all at once, so there is no need to go one by one. Thanks. Do you do anything professionally with EBook set up? If you don’t you should. Thanks. Seems to be working out pretty great so far. Trying to figure out how to make a table of contents now. Wish me luck. Thanks so much for a very informative article! I hope you can find the time to answer my questions—I would be forever grateful! From what you’re saying, it sounds like it’s entirely possible to modify and utilize Word’s inbuilt styles (Heading 1, Heading 2 etc) as desired—despite so many other articles that make it sound as if preparing a manuscript for Kindle means sacrificing virtually all formatting. Can only the inbuild Word styles be used though? I mean, if I create my own styles, will they not be recognized when the book is viewed on a Kindle device? Also, is there a limit to the amount of styles that can be utilized (can I use Word’s “Heading 4″ “Heading 5″ and so on if I need additional styles? Are there any Style modifications that may NOT be recognized on a Kindle, or that may not show up properly on a Kindle device? My manuscript is heavily reliant on the use of styles and formatting (a non-fiction book that has a lot of headings, variation in justified and centered text, and left and right indentation for different sections such as quotes, exercises for the reader and so on to set them apart). I know each user can set their desired font and font size… but is there anything else I should take into account when preparing my book for Kindle download? You can create your own style and use that instead of Word’s built-in styles, or you can use them in addition to Word’s built-in styles. I would only use the Heading styles for chapter headings and subheadings. I use a title or subtitle style for other text or images that need to be centered. I make new styles for non-indented body text, quotes, left indented text, etc. There is no limit (though I wouldn’t use more than 6 that have the word Heading in the name, as the Heading tag can sometimes relate to navigation, depending on exactly how you make your book—perhaps going beyond Word). You can center or justify styles, but if you want left alignment, you really need to save as a webpage, filtered and open the file in Notepad, then find the style definition and change justify to left for the alignment of that style. You can make text left-indented, right-indented, or just first-line indented. If the style is centered, you can also make it non-indented. If it’s not centered, the best you can do in Word is 0.01″ first line indent (choosing zero will backfire), but you can open a filtered webpage in Notepad to make it zero. You can define a style for quotes indented from both the left and right. Simple bullets may work, but may cause a few formatting troubles (Kindle has some issues with bullets, especially the older devices); yet in nonfiction bullets are common, so we often put up with it to some extent. Basic bullets are simplest. Nested indents can cause issues on older devices (and negative indents are a problem, too). As with e-books in general, there are issues that Kindles don’t recognize. Using the styles don’t get past that, but using the styles helps to achieve consistent formatting and helps to get a more predictable Look Inside. If you’re willing to edit the HTML in the webpage, filtered after using Word, you gain more flexibility there. You can always make a short test file with different kinds of styled paragraphs, upload that to KDP, download the file and view it on the downloadable previewer on the Fire, DX, and Paperwhite to see how it turned out (if you have any actual devices, even better). Good luck. Thank you so much Chris. I cannot say how helpful this has been! I have one more question if you are willing to answer it. Since I had read elsewhere that I should only use Word’s Heading 1, 2, 3, etc styles, I have already gone through about half my manuscript and applied these Heading styles (modified) to all areas of my text that needed formatting—included entire paragraphs of text that I want to be centered or indented. I didn’t think it would work to use any other styles or create new ones. I see now this was wrong! You say you would only use Heading styles for chapter headings and subheadings since they sometimes relate to navigation—perhaps going beyond Word. Can you explain to me what you mean by this? To be safe, should I go back and create a new style to use on these areas of text? Why do you use a title or subtitle style for text that needs to be centered, and new styles for non-indented body text, quotes, and left indented text? The book looks fine when I view it using the Amazon KDP Previewer, but have you found the previewer is not always reliable? A properly styled Word document can yield very good results, though some authors go a step beyond Word for a little more control over subtle features. The first step is to save as a filtered webpage, but this step doesn’t matter unless (A) you wish to edit the HTML to make little improvements or (B) you have images, in which case uploading a compressed zipped folder may help prevent little drop shadows from showing on the edges of one or more images. It’s probably not worth editing the HTML unless you have a list of specific things to look for and change. Some examples of what one can do include replacing pt-sizes for fonts with %’s (100% for 12 pt, 150% for larger headings, etc.) and removing any mention of font families. Or you can edit the images to make the width 100%. There are other possibilities. 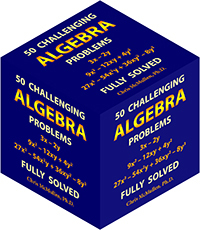 Some authors use programs like Sigil or Calibre, or yet others, to tweak the HTML and to create a table of contents that way. There are many roads to a well-formatted e-book. You already have a Word file, the easy thing is to upload what you have on your Bookshelf and see how that looks on each device. If you’re happy with that, it might not be worth going beyond Word. There are two previewers. There is a convenient online previewer that opens in the browser, and there is a downloadable previewer that you can use instead. The downloadable previewer is the more reliable of the two. Thanks, I have been looking for an answer for months! All it took was a little Style Box, LOL! Thanks so much! I’m so happy I found this! I was about to smash my computer after I couldn’t figure out how to solve the indentations! The process took me four hours longer than I expected. FOUR HOURS! But then I found this post and it was immediately solved. Thank you so much for sharing, I was close to crying haha. I’m glad you found a solution. Good luck with your book. Thank you. I am publishing my first book. You managed to include all the tips I need in a clear concise fashion. Thank you. I’m still having problems with section headings with extra spaces like it is “justified” very strange since everything is left justified. I think I may have to deal with it. Difficult because I can get OCD about it. Thank you again. Left alignment is tricky from Word as Kindle tends to automatically justify. One solution is to center headings instead. Another is to save as a filtered webpage and edit the HTML with Notepad or Sigil. (But if you have images you’ll need a compressed zipped folder.) In Word, you could try highlighting the heading and forcing left (usually, you don’t want to highlight and format, you want to let styles do the formatting instead). Good luck with your book. Thank you Chris. I reduced the font size which helped. I am going to center the headings… that will appease my OCD 🙂 Much appreciated. Try right-clicking on the normal style and choosing Select All before you modify the normal style. Chris, you are a genius! I have read formatting instructions so many times and they make as much sense as something written in a foreign language. Okay, the first time I read yours, I struggled, but I’ve just come back to try again, and I now have beautiful formatting. Oh, YABBADABBADOOOOOOO! I feel so chuffed I could stand on my head. Okay, well, maybe not quite that chuffed, lol. Please take a bow, Chris – you have managed to teach this li’l technoklutz, and that’s quite a feat. Currently working through this process at this very moment! Thank you for the excellent article. Have shared to my FB group: Authors/Bloggers Rainbow Support Club. Chris, your tip for removing unwanted indents helped me a lot. Do you have any tips to how I can get numbered lists with hanging lines where line 2 and so on have proper indents. It seems to work in some instances and not in others. Thank you. Lists come with many formatting challenges. For example, many formatters set them ragged right instead of justified since that indent exaggerates justification issues on smaller screens where the customer chooses a larger font size, though Kindle typesetting has improved for devices that support it (getting ragged right is a little tricky itself, as Kindle automatically justifies unless you know how to get around that). Some formatters also just type the number (or bullet symbol for unordered lists) and don’t use Word’s list feature (if they are using Word). Hanging indents (and multi-level indents), and indents with lists are tricky. Some formatters take the “simpler is effective and good enough” approach, and make a paragraph style for lists that indents the entire paragraph, and simply type the number or bullet symbol at the beginning of the line. You might find HTML suggestions at the KDP community forum or other ebook formatting forum, but it can backfire on some devices (that’s the reason for the keep it simple approach). Good luck. If one or two words here are there are italicized, do you have to have a separate style for italicized text? Or an you just select the words and hit italicize? Also, I have several letters written to one of the characters that I want to look different. What type style would you use to make it indented differently so that you know it’s a letter, or should it just be italicized? One final question. I read in another blog that Smashwords does not like m dashes — and ellipses …, that instead to use two dashes and three periods. Is this correct? I did not see that in Smashwords Style Guide. Thanks for a very helpful article. For publishing an ebook, only use paragraph styles. When only a portion of the paragraph needs a specific style, highlight and apply. When an entire paragraph needs a specific format, apply a style (don’t highlight an entire paragraph and apply formatting—simply associate a paragraph style instead). Italics may be okay. You could create a new paragraph style with a block left indent, but justification will appear nicer without a block indent. Em dashes and ellipsis have a few formatting issues. Amazon KDP supports them. If you publish with Amazon KDP, you have a few options for how to deal with em dashes and ellipsis. It’s been a while since I ran a book through the Smashwords Meatgrinder, so I’m not positive of the current status on supported symbols there, though periods definitely work, so that’s the safer option.